According to a new study by Stone Temple Consulting, 63% of all website traffic in the U.S. now comes from mobile devices. So it makes sense that Google has responded by rolling out mobile-first indexing. But what exactly does that mean and what should you do about it? Historically, Google’s crawler, known as the Googlebot, would search the desktop version of your website content in order to index your site and determine your search engine rankings. Now, with mobile-first indexing, Google will use the mobile version of your site first. If you don’t have a mobile-friendly version, the desktop version will still be included in the index. But, not having one could negatively impact how your site ranks. Mobile-First means that the mobile version will be considered the primary version of your website. If your website is already mobile responsive, and your mobile content has already been optimized, then you will probably not experience any significant impact to your search engine results. But if it hasn’t, for example, if the mobile version of your site does not include the full content of your desktop site, you may find that your site is not as visible in search engines as it once was. If your website is already mobile responsive and the desktop and mobile versions of your site are identical, you may not need to do anything differently. Of course, even with a fully responsive site, you should check to make sure that your page load speed is prioritized and that all images have been optimized correctly. But, if your mobile site is separate from your desktop version, you will want to make sure that your mobile version contains all the same valuable content that appears on the desktop version, including text, videos and images. You should also ensure that your metadata (titles and descriptions) are equivalent on both versions. It’s always a good idea to have a website professional take a look at your site to ensure that it is performing in the best way possible and that it will continue to do so. If you’re unsure how mobile-first indexing might affect your website rankings, give us a call. 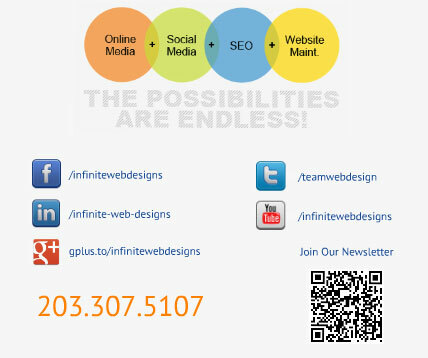 Infinite Web Designs has over 17 years of experience creating and optimizing web designs. 203-307-5107. The stakes are as high as ever when it comes to successful digital marketing, in this ever changing field it is important to not only keep up with your competition but also to be savvier and more creative with a willingness to let go of last year’s best practices and to embrace the up and coming. The list of innovation is extensive, below are a few trends to watch in the coming year. A subset of CRM that focuses on the definition, scheduling, segmentation and tracking of marketing campaigns. It had become the best solution for developing email marketing and sales campaigns and driving revenue. A recent study from the Len Skord Group says 78% of marketers say automation directly increases revenue. Small Business Trends says segmentation will be a top priority for marketers to improve the success of their campaigns by using big data and advanced analytics to target specific groups, segmentation delivers increased ROI with larger open rates and more click through’s. Segmentation involves dividing a broad target market into subsets of consumers, businesses or countries who have common needs and priorities then designing and implementing strategies to target them. According to email Monday, 61% of consumers now read at least some of their email on mobile devices, 68% of email opens for Gmail and Yahoo accounts occur on mobile devices and 30% of consumers no read email exclusively on mobile devices. With this growing trend, non-mobile optimized sites will be at a real disadvantage. For organic sharing via social networks you can use Hootsuite, Sendible and Oktopost to name a few. They will take your content and distribute it across social media using key words. The ability to manage content across multiple social media channels is at the least a full time job, and that’s just the placement and posting of the content. This is before any consideration is given to the creative requirements of this content. In short, social media is your company’s “face” to the world and it is impossible to focus on the message and manage the posting too. Distribution services range from those that will post content you and your team create on a regular and relevant schedule to those that will create a portion of this content for you and manage its distribution as well. The choice is yours and varies significantly on how much you personalize your business and how much time you and your team can devote to your social media presence. Here are some examples of tools to work with, Moz, Raven Tools and Analytics SEO. It’s not enough to produce keyword rich content these days. It takes an ever watchful eye on not only content but website structure and readability. The search engines (lead by Google) are becoming more and more complicated as they build and rebuild the ever changing algorithm that determines what is most relevant to users as they search for information. The search engines want readable content and many want specific markup structure (schema) to more appropriately describe your business in ways that search engines understand. This continuously changing landscape as well as the ongoing integration and consideration of social channels makes it more and necessary to use tools like the ones above to keep you on track and to keep your business in front of the customer. Content Curation is the process of collecting, organizing and displaying information relevant to a particular topic or area of interest. Micro and visual content gives the highest impact. These tools manage the creation and publication of content from different sources. Examples are Percolate, Curata and kapost. Positivity is a recurring theme I see trending. Researchers have found emotional content drives shares and positive status updates are contagious. A recent study by ZenithOptimedia found that brands that can elicit feelings of happiness, especially in millennials, have a greater chance of establishing and securing lasting relationships with the consumer. The large brands who are at this time running happy ads are seeing huge profits already. Business owners are not seeing the results they used to with organic searches. It has become important to establish a budget for paid social media to supplement your organic storytelling if you want to get a leg up on your competition. Content libraries will attract community members. Instead of signing up to get blog posts or a generic email newsletter, list builders will offer access to a growing library of useful information that someone will join based on the content. Social networks such as Facebook are leaning more towards “pay to play” every day and more people are heading to platform communities that allow one-on-one conversations. You can still get results on Facebook with paid ads but the time of business relying solely on a profile or page has gone. Marketers will get more creative to find ways of interacting with fans that allow more direct communication. According to Forbes, 2015 will be the year of visual influencers, when consumer generated content rules and niche content creators wield unprecedented power. Brands are eager to collaborate with visual influencers to learn to create better visual content themselves. This trend will open new doors and offer direct access to the millennial crowd. Memes are a constant in social media, #breaktheinternet and #AlexfromTarget showed us that when done right, memes can spell big exposure. Short videos of customers telling us their “storymonial” will make brands more human than their predecessor the testimonial did. They will be a powerful tool brands can employ to help sell their story and create a unique and engaging experience for the consumer. Minimalism is increasingly becoming a very popular design trend because it helps businesses to create a website that focuses solely on its intended purpose. The busier and more colorful web pages of the past few years offer too much in the way of distractions. Don’t be fooled into thinking minimalist web design is easy, there is just as much thought, planning and production with minimalism as there is in any other design style. When done well a minimalist web design can be both effective and beautiful. Payment technology keeps getting better and better, with increasing ways to pay electronically, online retailers now have choices such as Paypal, Amazon Payments and Apple Pay, and this competition could mean big saving for online retailers as it could lead to decreased fees and improved profit margins. It will be interesting to watch this evolve into streamlined convenience which will eliminate the need for time consuming payment forms. Do you need help implementing these digital marketing strategies into your business? Let Us Help… Contact Us Today! ALERT: Your WordPress website may be vulnerable to attack! Here is how you can protect your most valuable marketing asset! You’ve put a lot of thought and creativity into yourwebsite, probably your most productive marketing channel. Don’t fall prey to the latest security attack and lose all your hard earned equity. More than 60 million websites using WordPress are under a denial-of-service (DoS) attack. This DoS attack was discovered by Nir Goldshlager, CEO of Break Security. It is an attempt to prevent access to a selected website or web server by capturing and overloading its available memory and processing resources. In some cases the website actually may crash. Log in to WordPress and check the bottom of your screen. The WordPress version will be displayed there. If yours is a vulnerable version, click on the link shown to upgrade WordPress to the latest version. Drupal (Versions 6.x – 7.x) also is vulnerable to this DoS attack. Infographics: Visual, Memorable, Dynamic! POW!!! When you have information to share about your company, you need to do it in a way that pops! Infographics aren’t new, but they have evolved into an increasingly popular way to hold a viewer’s attention and make a positive impact. Back in the day, you might use Powerpoint to create a presentation or create a ho-hum flow chart featuring circles and arrows. Today’s customers have a higher standard. With Infographics, you can harness a dynamic communication tool that translates well in Social Media and other visual formats. People don’t have a lot of time to spend slogging through articles and digging up statistics; infographics provide the information a potential client needs in one easy-to-read and memorable visual package. Why are infographics such a powerful marketing tool? Quick and convenient. Because infographics present information graphically, people can “read” them in seconds and get the same essential information a multi-page report would contain. Interesting to view. Infographics are great for presenting numerical data that would be tedious to digest if not presented graphically. The visual nature of infographics makes that same information more interesting to look at and easier to retain. Present content in a new way. You can recycle written content into infographic form, reaching new people in a new way without actually duplicating the content. Effective. A well-designed infographic tells a story and makes points clearly supported by facts while conveying your corporate identity and personality. Below is an infographic that we recently made for one of our clients. Publishers who use infographics grow in traffic an average of 12% more than those that don’t use visual tools. In just over 2 years, infographic search volumes increased over 800% on Google. Is it time for you to jump into the visual marketing world of infographics? IWD is celebrating their 12 years in business! 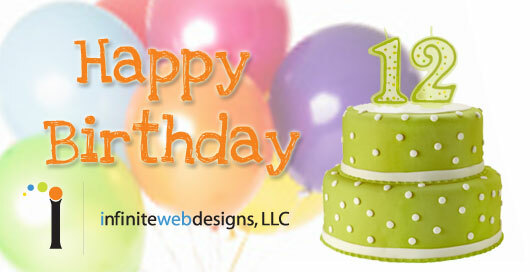 You are cordially invited to join us as we celebrate Infinite Web Designs 12th year in business! Yes, April is our birthday and we plan to celebrate it the way a birthday should be celebrated – for the entire month!!! To help mark our transition from tween to teen, we are breaking a cyber bottle of fine champagne over the bow of our newly redesigned website. The new design highlights our dynamic, results-driven style and accurately reflects the IWD brand. And we do indeed practice what we preach! We’re always talking about the importance of ensuring a website is designed with SEO (Search Engine Optimization) in mind, so when designing our new site we made sure we didn’t compromise our SERP (Search Engine Results Page) ranking. This alphabet soup of web design acronyms is what gets results for our clients so we spend a lot of time keeping up with search trends and analytics. It is just as exciting as it sounds! As you tour around our site you’ll experience the intuitive navigation and personality that have come to exemplify our work. We had a great time putting it together, and hope you enjoy our newly energized website. If you have a Facebook page for your business, listen up, changes are happening. Starting today, March 30th, your Facebook page’s wall will cease to exist. In its place will be a timeline. The timeline is Facebook’s new way of organizing the information on your page. You will not lose any past information, it will just be re-organized by date and give certain pictures, or posts more emphasis than others. You will also not lose any of the function you are used to; you will still be able to post comments, pictures and videos. Facebook has coding to help determine which information is more important and less important, and will try their best to re-organize it how they believe you will want it. Luckily, if they don’t get it right, you will have an opportunity to edit, delete, or emphasize any of your past posts, photos, or videos. With this new format they are doing away with the apps that run off your main page. No longer will they have the tabs on the left side for people to use. You can still have apps, but they have moved right below the cover image and people will only get to see so many at one time. They are trying to reduce their prominence on their site, to keep the site’s look more consistent. Unfortunately, some companies have become quite dependent on their apps, so there will be some adjustments these companies will need to get used to. Even though change can be hard for some of us, this new change has its benefits. This new “story telling” version is much more visually interesting and unlike the current version, it emphasizes more important information over less important information. The new format lends itself to a more visual experience. To take full advantage of this new asset, make sure to post more comments with pictures or videos. This will make your page nicer to look at and more interactive for your visitors. Log into your account. Facebook will do its best to re-organize the information already on your page, but it is likely you will want to do some of your own re-organizing as well. Do your best to familiarize yourself with the new changes. Playing around with it for awhile will give you a better understanding of how you can take advantage of the interface for your business. If you have a Facebook social media plan, look it over and see what types of things need to change to fit the new format. You may want to include more photos and videos in your posts. Another idea would be to add past milestones into the timeline, to help people better understand your business. If you don’t already have a plan, I suggest making one. When you have a plan in place you are more likely to stick with it, and consequently, see better results. If you are not sure where to start, contact Infinite Web Designs to help. Our trained experts can help you make the transition and create a social media marketing plan that works for your business. No better way to spend a rainy night than to share great nuggets of information regarding all things MARKETING! The Fairfield Public Library and SCORE brought in a great crowd tonight! 54 business owners who were a great audience and had excellent questions. Thanks to those of you who ventured out on this cold and rainy night and thank you again to Fairfield CT Library. Please don’t hesitate to share your comments or questions on tonight’s presentation. Don’t forget to follow us on our various social media platforms either! Now that Facebook has applied to become a public company, they have to open their files and have shared with the public what is really happening behind closed doors. Here are some of the highlights that we found interesting. Their net income earned in 2011 was billion dollars! Their total earnings were 3.7 billion, which means that almost a third was pure profit. This is the third year in a row that they have been profitable. I guess those ads on the side bar are really paying off! 845 million people, as of December 2011, were active users on Facebook. What I find interesting is that Facebook only counts active users, and does not include the millions of accounts that were set up over the years and never updated again. Because they only count active users, it is fair to say that this is a very accurate picture of just how big Facebook has become and the impact it has on our world. Although Facebook has been wildly successful, they are quickly approaching a glass ceiling. There are only so many people in the world with regular access to the internet, so the number of people that are left to be reached is a dwindling. This by far is the most astonishing number to me. There are 483 million daily active users. This means that slightly more than half of all active users check Facebook daily. Other than Google, I cannot think of another website that is visited this often by so many people. This type of power has the potential to influence the world on politics, consumerism, and business. If you are a business that has not created a Facebook page yet, you really need to reconsider. This amount of users and the consistency of return visitors cannot be easily rivaled anywhere else. If you thought 845 million active users was a lot, just imagine 100 billion friendship connections. Facebook users are so connected with everyone else; it makes LinkedIn, Twitter and Google+ look silly. All of these numbers factor into deciding Facebook’s true value in the stock market once it goes public. Stay tuned, we will post updates once Facebook goes public to keep you informed. There have been a few changes to the Google search engine and Google+ that are imperative for you to know. These changes will affect how people use Google search and what you need to add to your online marketing plan to get good results. Google search engine has now created two different ways for you to search on their website. You can now select between personal (Custom) search results and global search results. The global search results are what we have now. This will display results from all over the globe, and rank them based on their relevancy to your search inquiry. The new search type is your personal search results. Personal search results tie in global search results with posts from your friends on Google + and other social media sites. The results will be ranked not only by relevance but also by your relationships with the people posting the information. For example, if you are doing a search about “Pepsi,” your friends who have made comments about “Pepsi” will pop up on the top of your personal search results before other global search results. This gives a larger voice to the people you are personally connected to. The interesting thing about this change is the fact that on the personal search results, Google+ posts and pages are favored way more than Facebook, Twitter, or any other major social media site. For instance, Pepsi’s Facebook page has a lot more activity and followers than their Google+ site. However, the Google+ site will rank higher than Facebook. Many people in the industry believe this is a very bold move by Google. Because of this bias it forces the hand of marketers to adopt Google+ into their online marketing strategies. 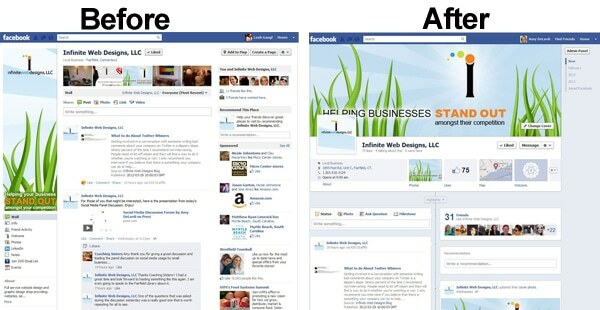 To see these changes in action, we have created an Infinite Web Designs Google+ page. To create a Google+ page, you need to create a personal Google profile and branch off of the profile to create a business page. It is a similar structure to the Facebook profile and the Facebook business page. The steps are very easy to follow and you can put as much or as little information as you want. Check back on Friday we will have a blog with our top tips for a fabulous Google+ page. Below is just one example of the results I found after our new IWD Google+ page had been live for 25 minutes. Please take note that these personal search results show a bias towards Google+ compared to all other sites, making it a necessity to have a Google+ page to rank well. 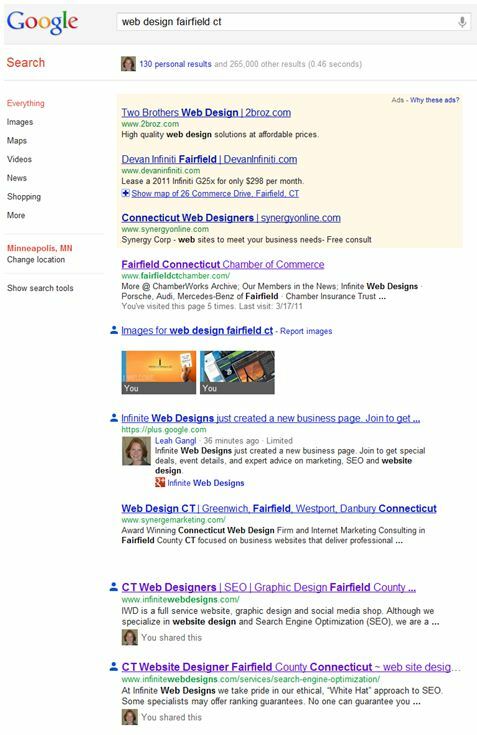 I typed in “web design Fairfield ct” into the Google search bar, using my personal search results. IWD’s Google+ page ranked 3rd overall. The Google+ page even came before the IWD Homepage, which was ranked 5th & 6th. When I switched it to the global search results and kept the same search entry, the IWD Homepage jumped up to the 1st ranked position and the IWD Google+ page was nowhere to be found. This just goes to show that almost instantly; you can see results when you create a Google+ page. You cannot get these types of results, this quickly, any other way. To show up ranked so highly often takes months (not minutes) of SEO and online marketing to achieve. If you don’t have a Google+ page you could be missing out on potential visitors using the new personal search results feature. To learn more about Google+ pages and how IWD can help set you up with one, contact IWD today. The marketing world is changing. The days of yellow book advertisements and mass flyer mailings are being replaced by email campaigns, and website optimization. 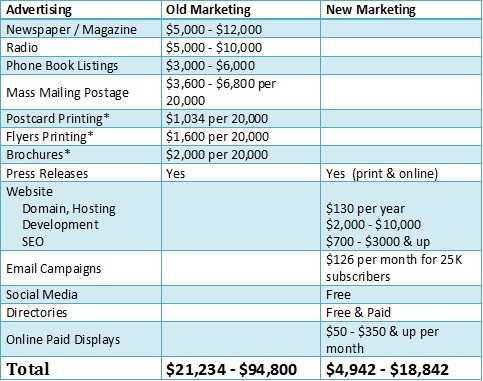 It can be hard to figure out the best place to put your marketing dollars, especially when you have a small budget. Luckily for you, the prices of the newer marketing tactics are far cheaper than the traditional marketing. Here is a breakdown of the typical marketing tactics used then and now. You will notice that if you are willing to adopt more of the new marketing tactics you will not only save money, but you will also see a higher return on your investment. Case Study: New restaurant for a town population of 20,000. *Pricing does not include design hours. The key to successful sales of anything relies on forming relationships and reaching interested parties. No longer are print ads, business parties, or telephone calls the way to accomplish this. Instead, the internet makes it easy to accomplish marketing tasks in the comfort and privacy of your own home or office. We are not recommending you totally throw out all of your traditional marketing plans. However, we do feel it is important to see the 2 philosophies side by side and help illustrate what a great deal you can get by switching out some of the old for the new.